EE and I went to the Office a couple of mornings ago. 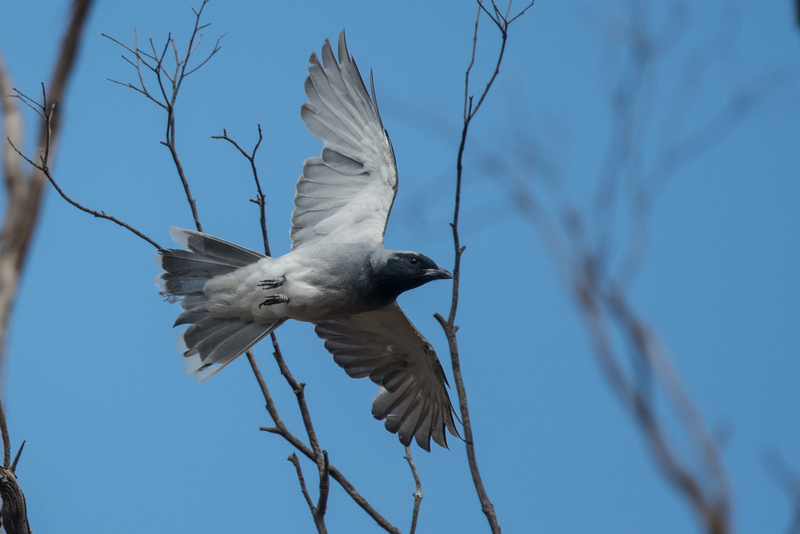 As we were walking over the river bridge we were discussing the small number of Dusky Woodswallows that had nested in the area. And how they were now probably well on their way north. 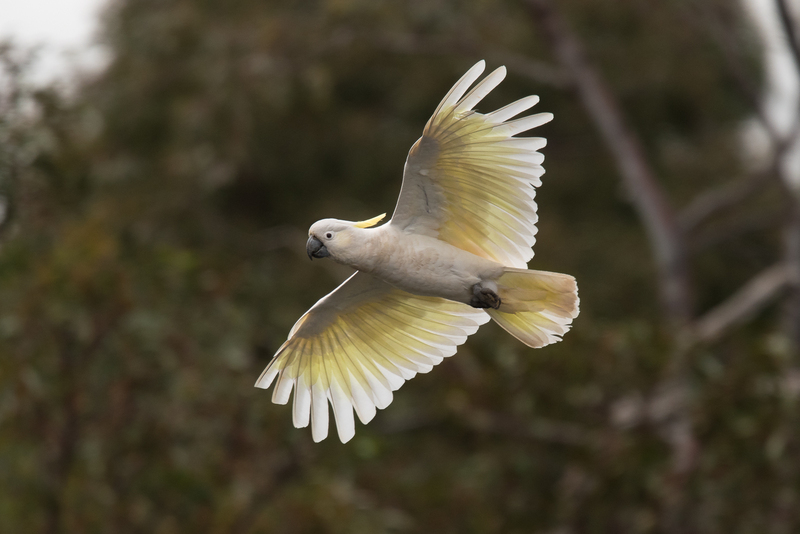 When to our surprise, as much as anything, we heard the calls of them as hawked for insects in the sky overhead. 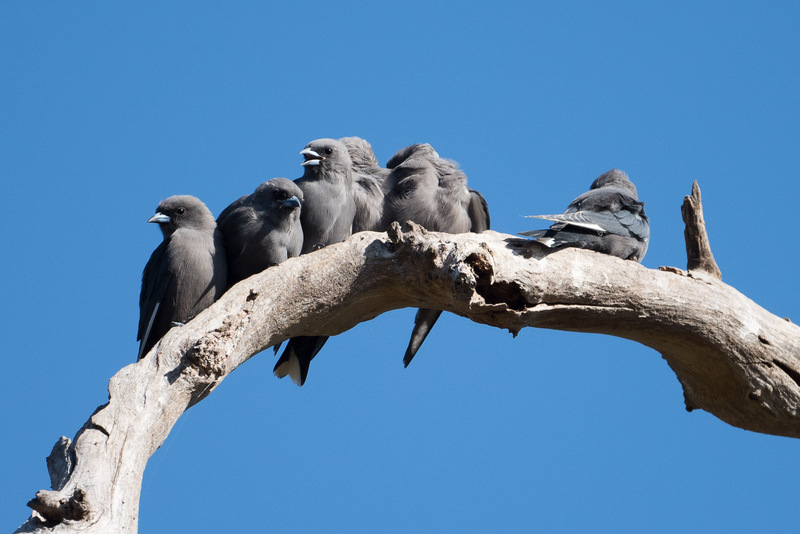 Like Choughs they are very community dependent, and its not unusual to see dozens of them sitting on the one branch all jostling for the best position. These are no exceptions. However with good grace the birds make room for one another, even if it means flying off and relanding. They were still feeding young ones, so I concluded they must have had a late season nesting before the cold weather sets in. 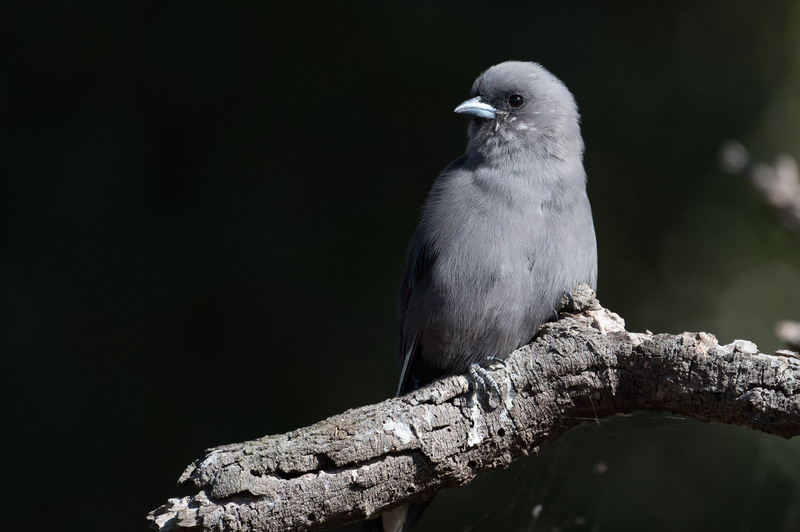 Woodswallows have the ability to both fly and glide like swallows. Food is still in abundance. Fear not, this is not that blog. Great gasps of relaxation and sighs of relief heard across the ‘blogosphere’. I really wanted to get the remainder of the shots from our Eynesbury excursions, (incursions?) out. So rather than belabour, here is the best of the rest sort of feature. There is still one more chapter to put up, but I’m going to do that as a Snapshots type blog as it concerns our favourite Jackys and their now well fledged young. Might even get that done the next few days. After about 20 attempts this is as good as it got. 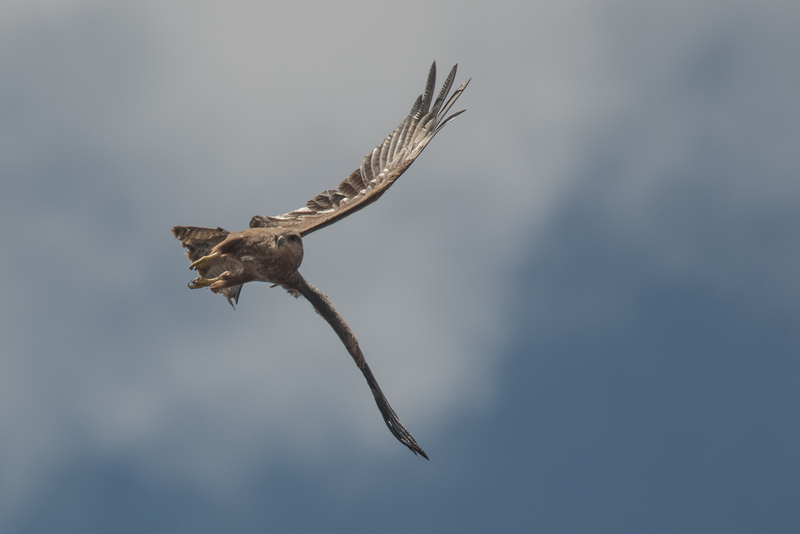 A Tree Martin flying in with food for the young. I think that Tree Martins have multiple families at nest inside the hollows. 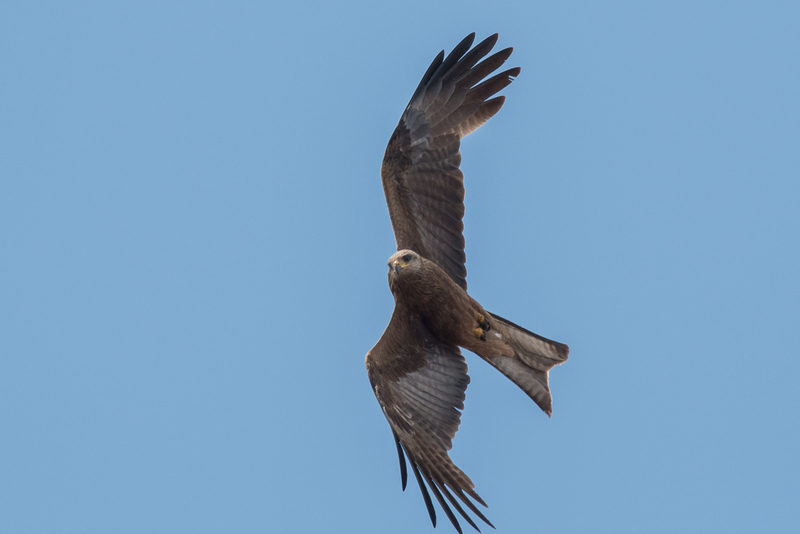 A very young Black Kite. 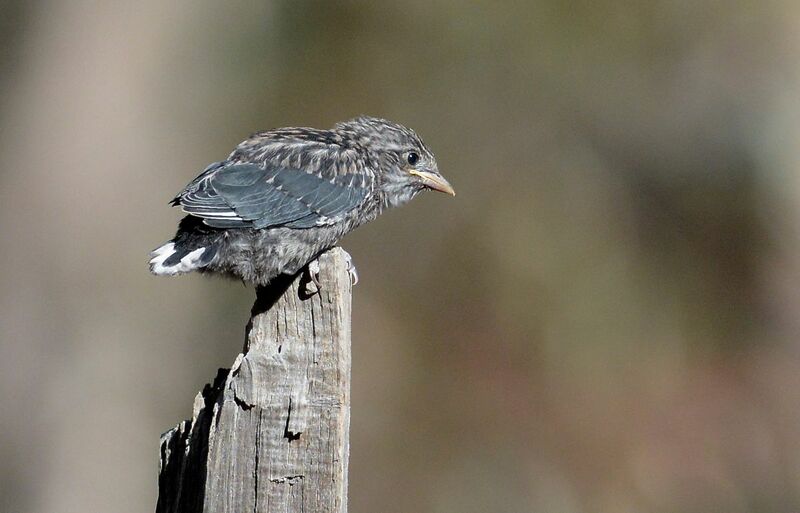 We sat with the young bird for several hours over three days, but didnot see the adults come to the nest. 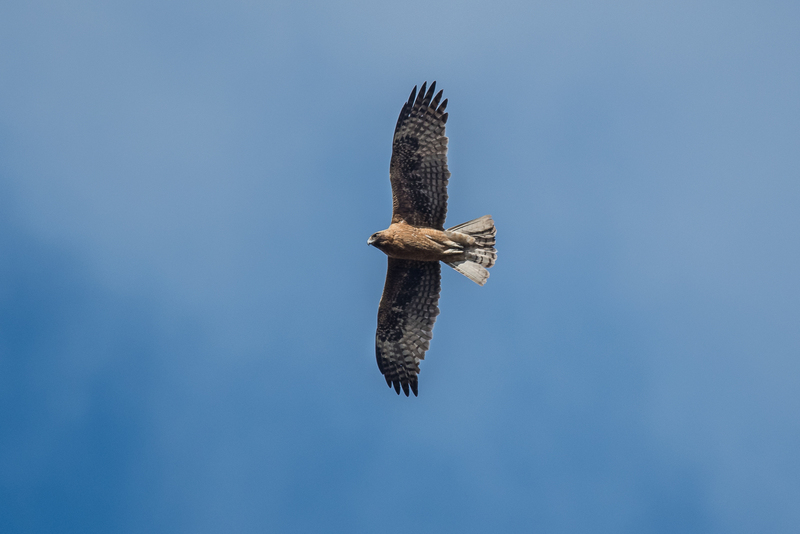 However there was a constant overflying as they kept check on the young one for above. 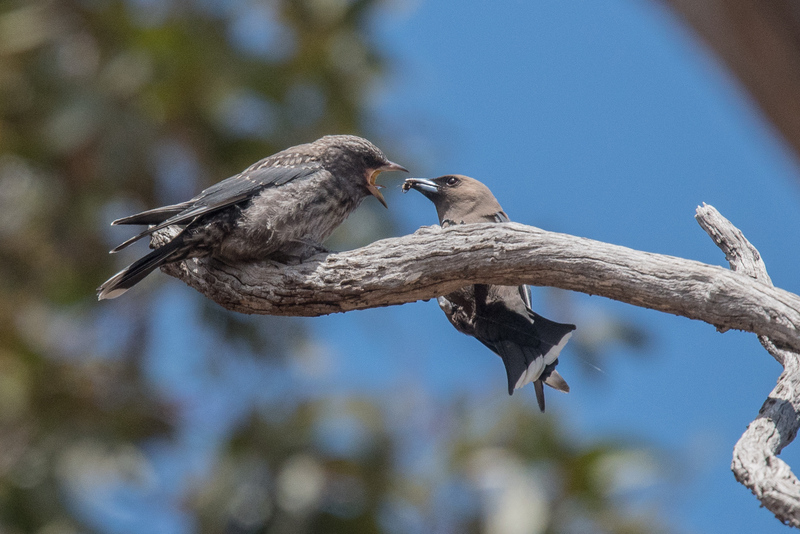 Overenthusiastic young one just about unperches the adult. I love the look on the adutls face. This looks like family fun, however food is involved and when the adult arrived to feed the lower bird, the upper one flew in. 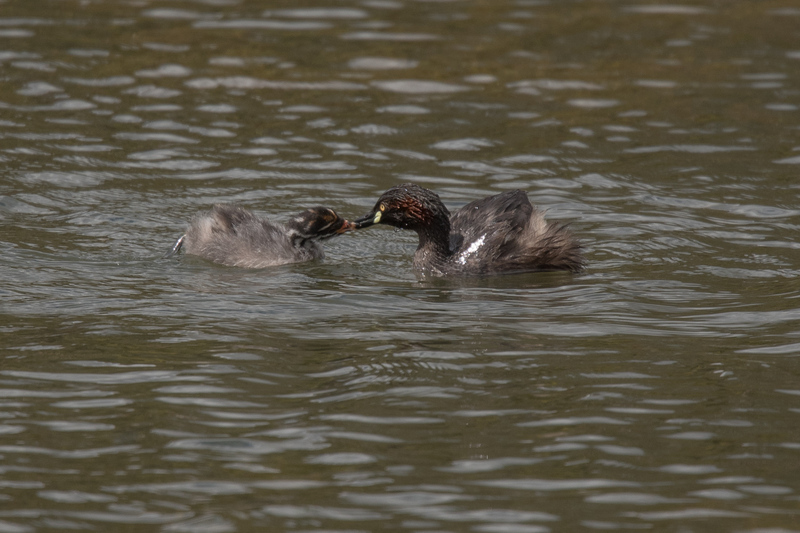 Then to get in a better position to be fed, it ‘stepped’ over its rival. 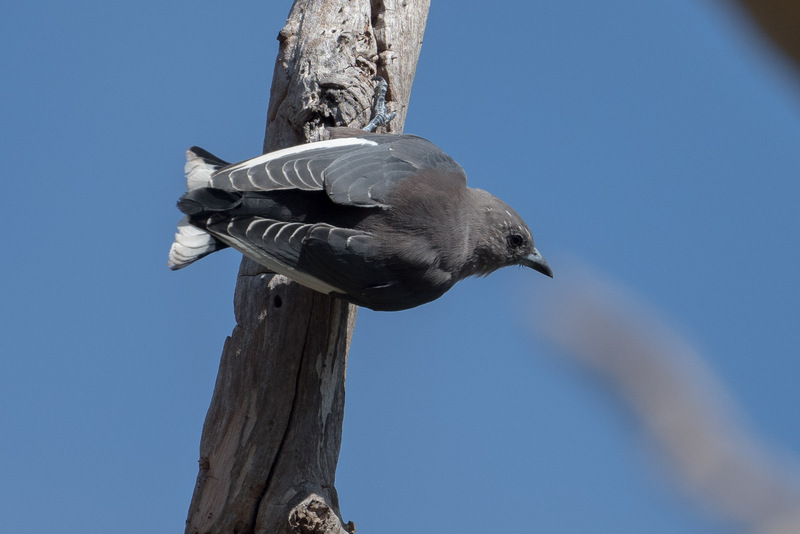 The adult sovled the problem by flying off the end of the branch, circling and landing nearer the lower bird. It’s not always the loudest and largest beak that gets filled. Little Eagle. 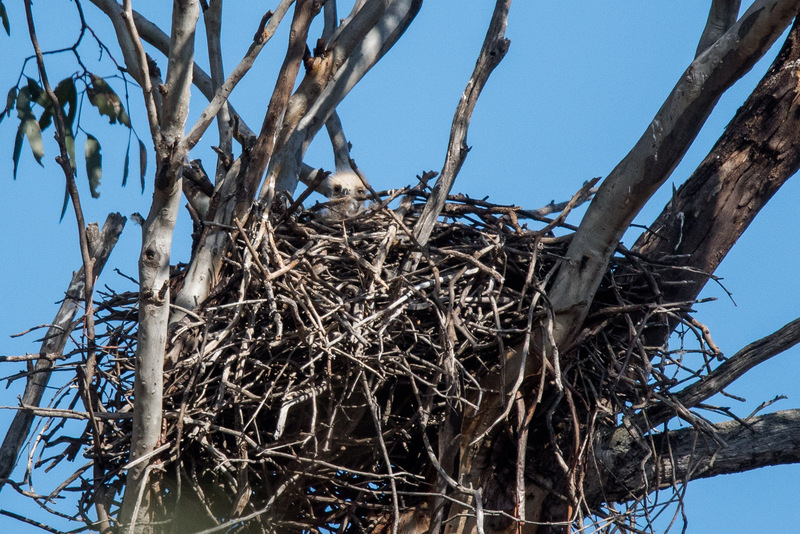 Eynesbury has a resident pair of Little Eagle. I suspect, from the calls, that there is a nest located on the western side of the forest, but have to say I’ve been out of luck locating it. Watching Jacky feed is quite interesting. The young don’t cry out for food. Most times they don’t even respond to Mum or Dad arriving. Then there must be a quiet call, and they quickly pop up, the food is delivered and they both settle straight down. It’s also not unusual for the adult to spend a few minutes alongside the nest making sure all is well before flying off. Eynesbury township just a few minutes from Melton, was established around a golf-club. Part of the deal concerns a stand of Grey Box Forest, that is in close to original condition, or perhaps, well established with old trees and understory, might be a better description. It was used until the mid 1950s as a pastoral area, and the forest was used to run the shorn sheep from the shearing sheds in the area. Many long term readers will know that its been noted that I have Grey Box sap running in my veins and a visit to the Eynesbury Forest is enough to rejuvenate the lowest of my spirits. The local Eynesbury Conservation Group, you can look them up on Facebook, conduct a walk on a Sunday morning every two months. Usually led by the award-winning Chris Lunardi, a local identity; EE and I make it a point to turn up if at all possible. Much to see in a day, so we cheated, and went back for a second look the following day. Here are some of the Gems of the Forest. Little Eagle, one of a pair. And try as I might I’ve not been able to locate their current nest site. 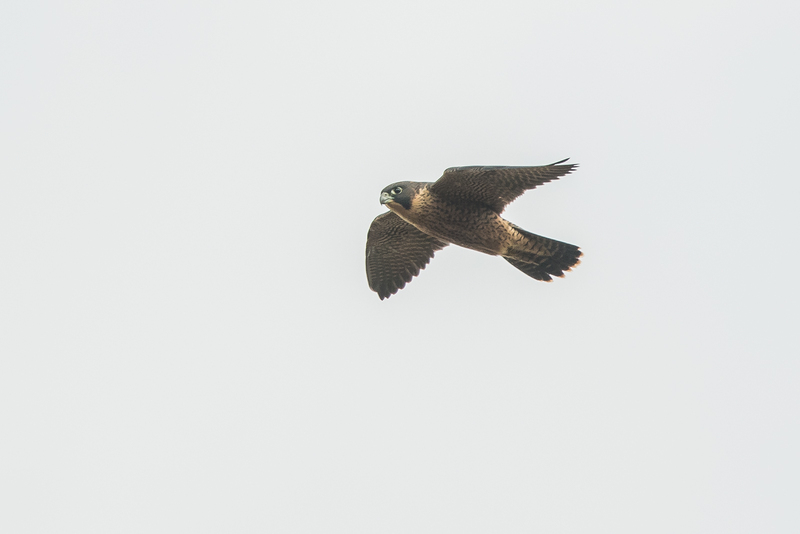 Peregrine Falcon, a new bird for me at Eynesbury, this one is working on short wings with quick flutters. 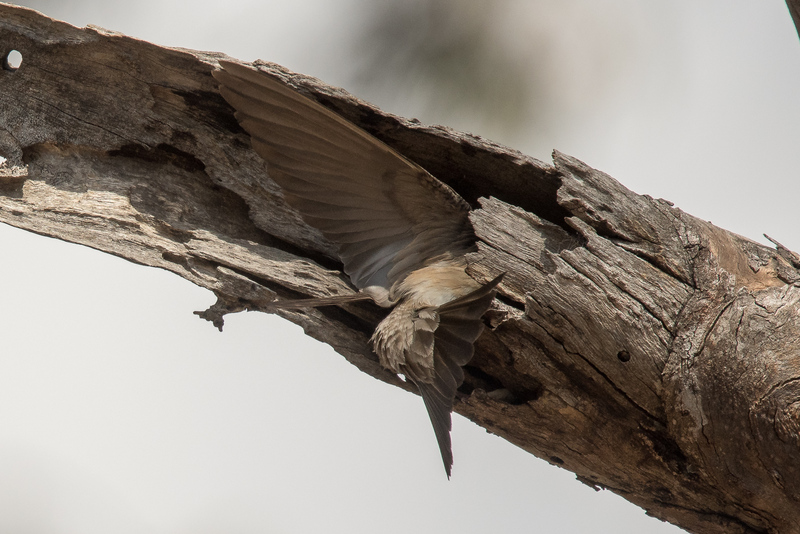 Target— Tree Martins that are nesting in the forest. We found at least one carcass to confirm its skills. 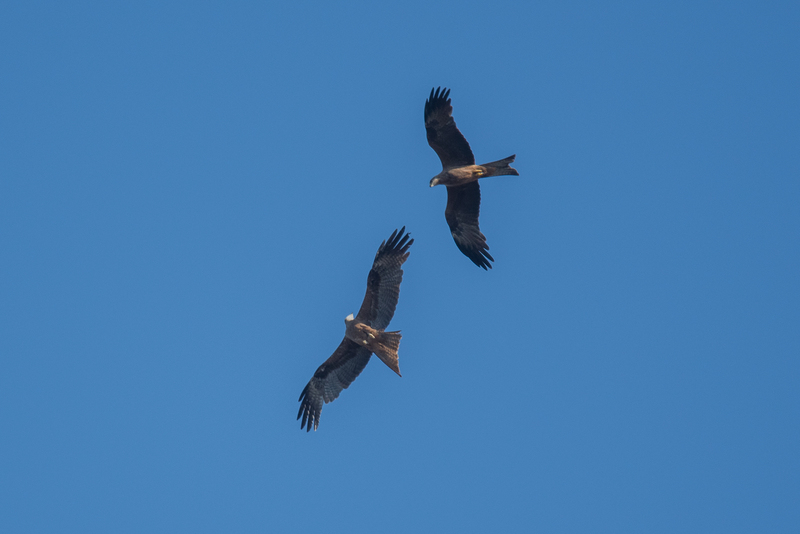 Two Black Kites were in the air having the best time on the strong winds. it really deserves a blog page of its own to describe and show the antics of this couple of birds, but two should do eh? 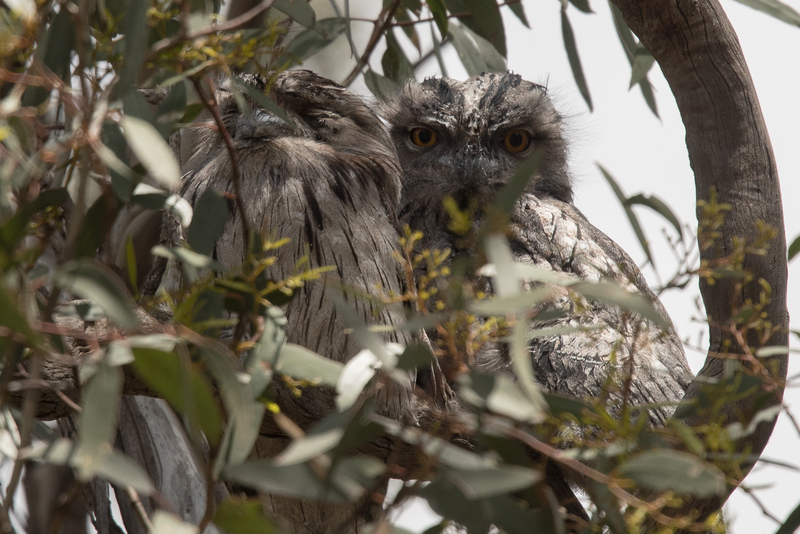 And finally two of the Tawny Frogmouth from the Children’s Playground park. Other photographers, you know who you are Lyndell, seem to be able to get them on days when they are low down, in the open and all together. They seem to be quite happy to sit in the trees while kids play about on the swings and climbing things just metres below. Another episode to come I think. Been a bit frantic with a number of projects the past week or so, and have a bit more to add to Studio Werkz. EE suggested a bit of a break from serious bird photography, and an early morning at the You Yangs Park sounded about right. We were pondering what to do for new years eve. Not being the standing around with glass in hand yelling at someone over loud music sort of folk, nor having the need to declare some new resolution, such as “Take more photos in 2014” or drunkenly exclaim, “I’ll photograph every species in Australia, in 2014”, we decided on a quiet evening. Besides, I’ve seen a few new years come and go now, and apart from ripping down the old ‘last year’ calendar and gleefully putting up the new one, not much changes. We in the end picked on a picnic in the forest with Karen, Jimmy and Ginger (recently named as the story will show). 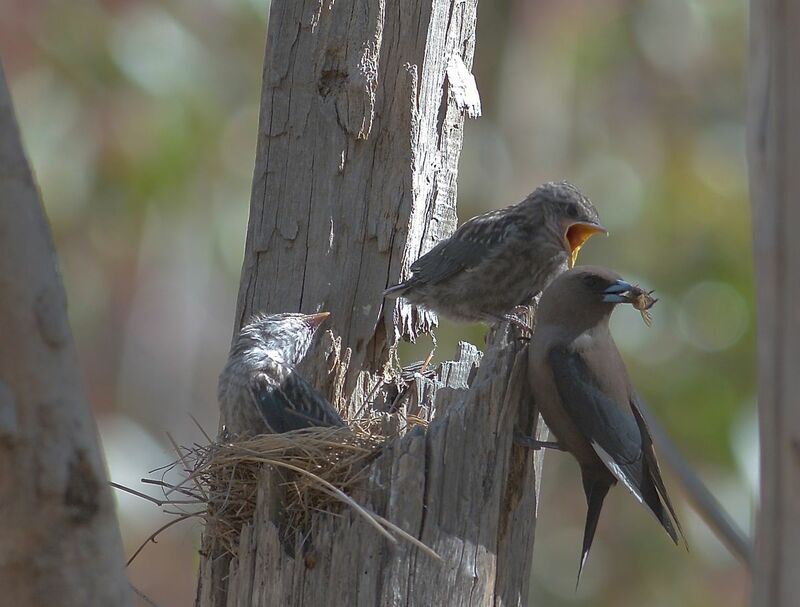 There is also the family of Dusky Woodswallows, and while EE settled in with the Robins, I went a looking for the Woodswallows. 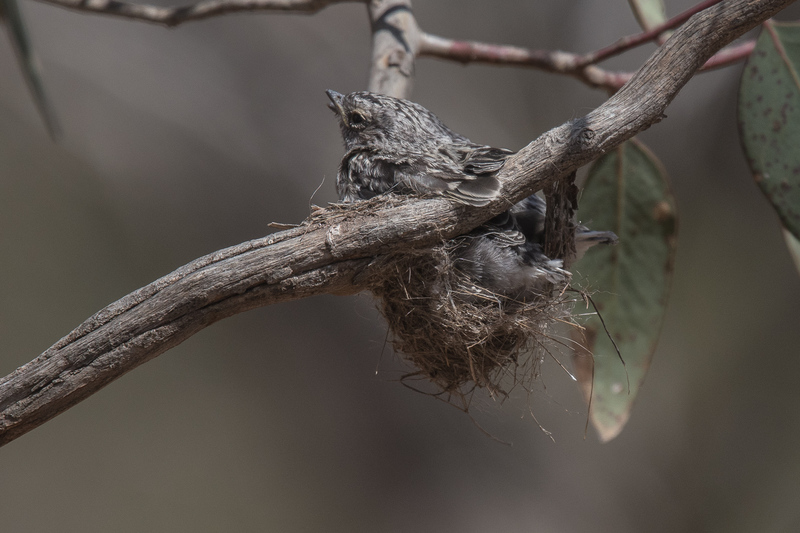 To be honest, I thought they’d be on the wing by now, and it was a pleasant surprise to find that the three chicks were still in the nest, or should that be very over crowded nest. Much preening wing polishing and down removal was going on. 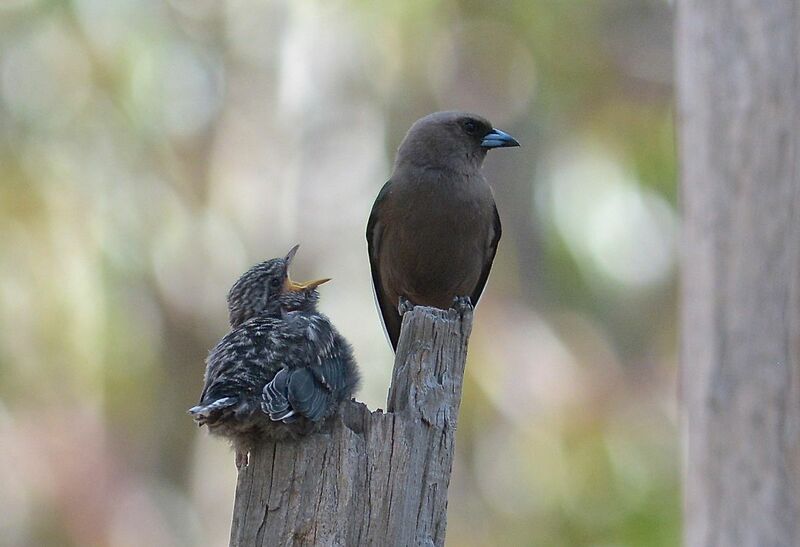 The parents kept up a steady supply of food, and in the end I thought it was just another day in Woodswallow land. Till one of the parents dropped in on the top of the post, and the largest of the chicks proceeded to climb up the shard of wood to meet it. After much begging and wing fluttering, the adult flew away, calling softly as it went. 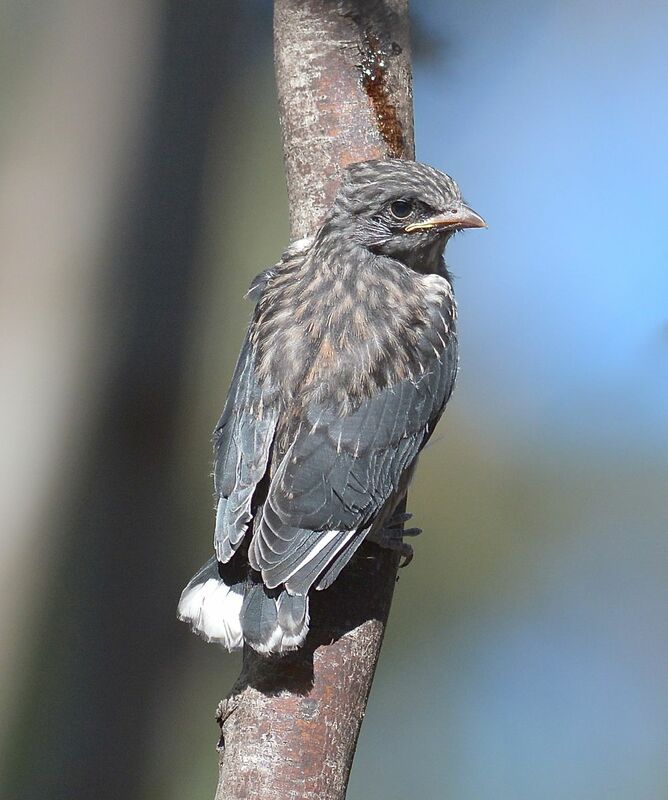 The young one attained the top of the stump, and did a couple of quick wing flaps, and a few more straighten up those feathers, flapped once, and … was gone! So much so that I’d taken the shot of it wings extended, and when the mirror on the camera came down, there was not bird to see! The other two looked on in amazement, then decided there was so much more room in the nest and settled down to have a nap. 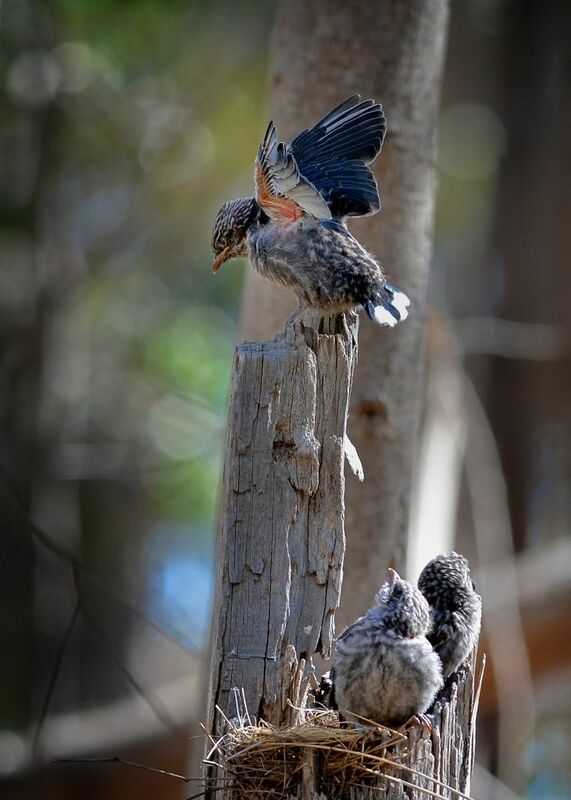 The parents had other ideas and more food arrived, more cleaning and flapping and eventually the second one flapped to the top of the stump, and simply jumped. Oh, flap, flap, flap, and it sort of sailed down to the ground, then hopped from branch to branch on the ground trying to figure out what to do. More food was the parental response. Meanwhile back at the nest. No way was the third one moving. Much discussion ensued with the parents, and they got a lot of cheek for their trouble. 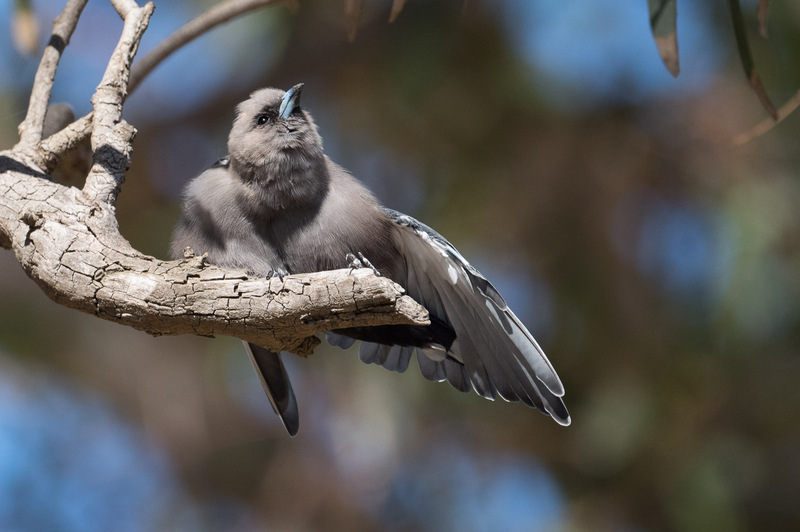 Mostly I suspect in Woodswallow for “You don’ t image for one moment that I’m going to leave the security of this nest!”. 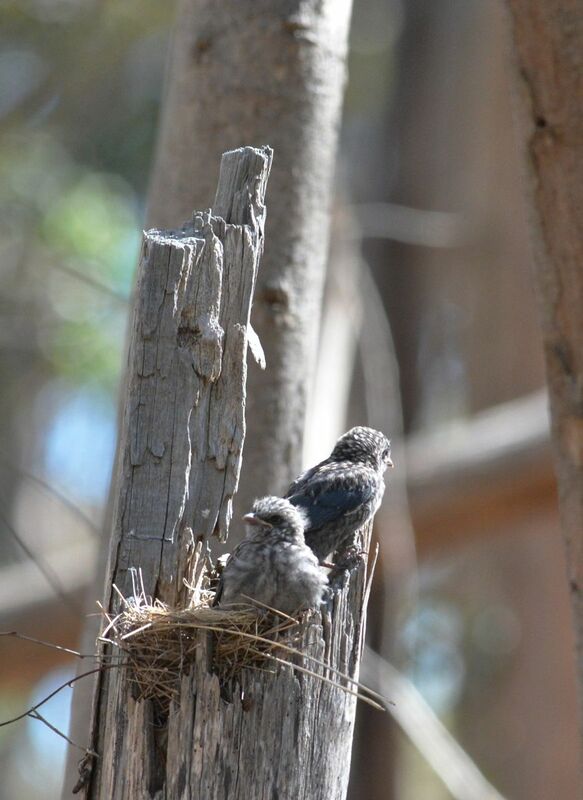 Try as they might it remained stubbornly in the nest. But in the end, of course, the need for food became greater and it reluctantly took its place on the top of the stump. And waited. So did I. And after what seemed hours, (it was probably only 5 minutes), it too made its first journey on the wing. To the delight no doubt of the parents. They of course had now created a new problem for themselves. 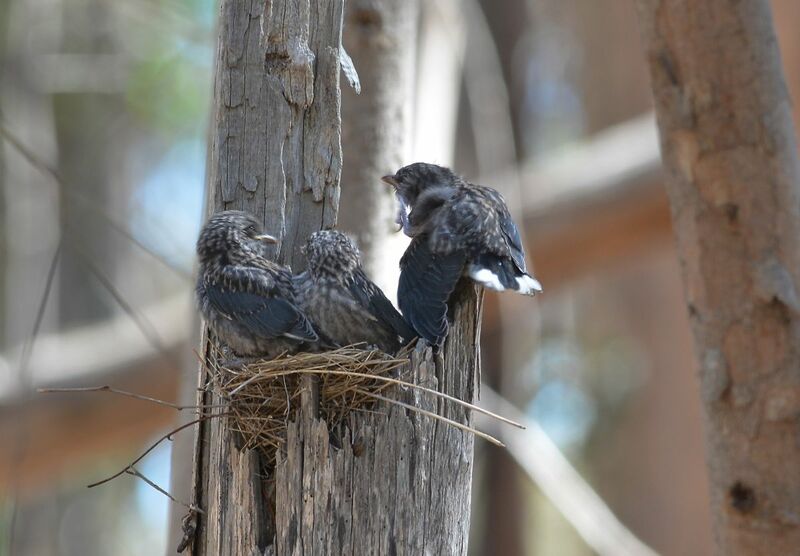 Three young birds with no navigation skills spread out over 100m of the forest and they still needed constant attention and food. When I left, they were doing the rounds with supplies. Not that they were hard to find, the young put up quite a wail when they were on their own. Climbing up to sit with the parent. Now we’ve got plenty of room again let’s settle down for a nice nap. More food, that should get you going. Let’s discuss this mum! I stay here you bring the food ok? On the cusp of adventure, but just not ready to make that leap of faith. I’d wanted to take a longer walk up to the Sugar Gums and see what was happening, but time was always beating me. So this morning I left early. Something nice about the bush as the sun rises, and it all begins to come alive. But, the further I walked, the darker the clouds became until it was obvious that it was, well, raining. I’d done the boy-scout thing and packed the “Driazabone” and it is, so wasn’t too fussed. As I stood under a tree trying to keep the camera dry, Will O’Scarlet came by in the rain for a visit. He looked like a good trip though the spin-dryer was in order. Not much at the Dam, so I went on up to the Gums. In the rain I found a collection of Dusky Woodswallows and finally made a few sharp images of them. But in the end, the rain was the winner and I retreated back to the car. 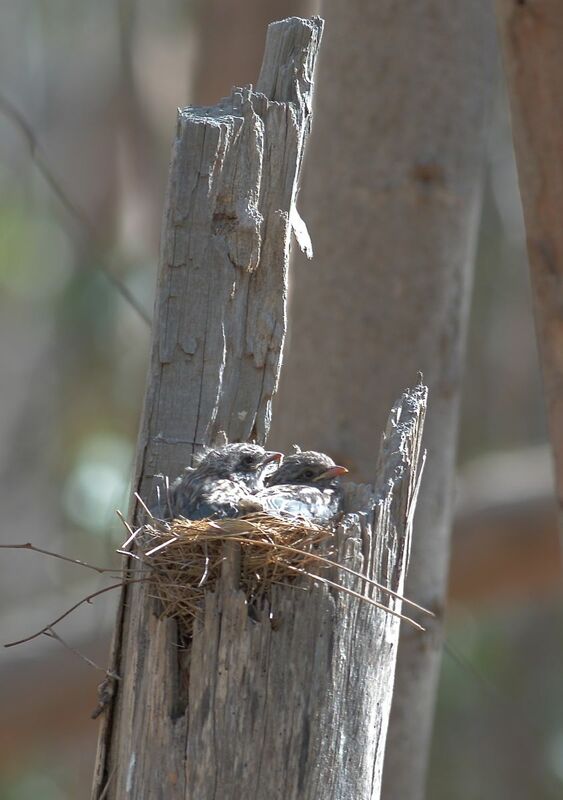 Passing the Brown Goshawk and her three chicks and waving to the Tawny Frogmouth family. Inside the car was, well, dry. Will O’Scarlet in the rain. He come bounding through the trees to check me out, and once he’d figured it was me, moved on to other more important activities, which I presume included drying off. 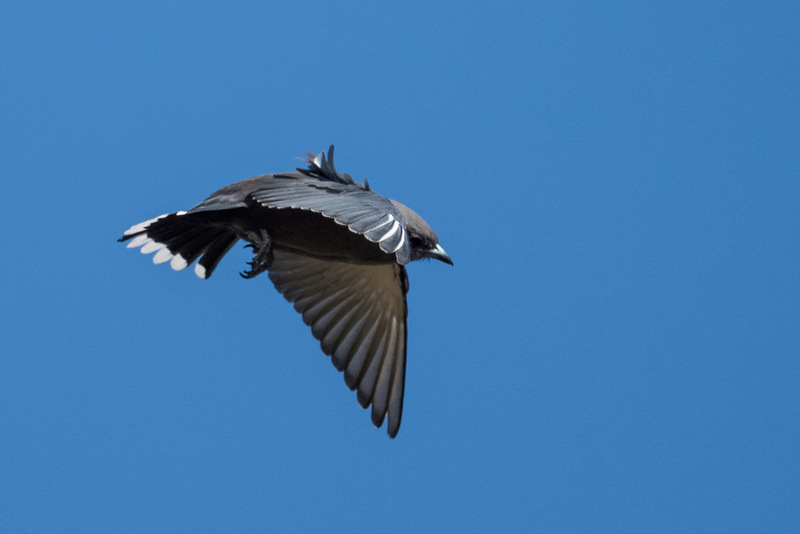 Dusky Woodswallow hunting in the rain. 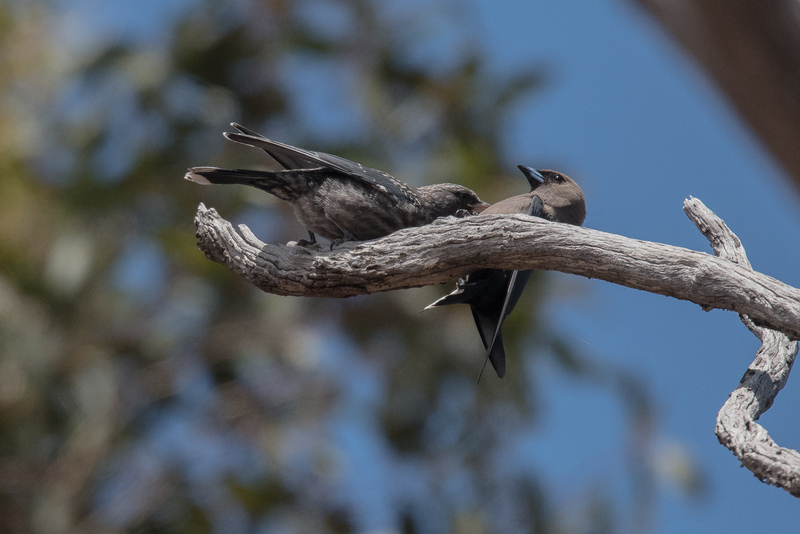 Dusky Woodswallow, hiding behind the branch. Not sure why, but it slipped itself down low and was looking very attentively into the trees, I didn’t spot anything unusual, but it was certainly trying to keep out of sight. With the backpaddock now devoted to the enjoyment of two foxes, and some soon to be introduced bandicoots, it’s been time to find a new area to explore. Luckily Woodlands has an abundance of locations and habitats. On the promting of our friend Richard, we decided on an excursion up into the Sugar Gum plantation. This is pretty old vegetation these days, and has more than a few species so we expected a bit of a treat. 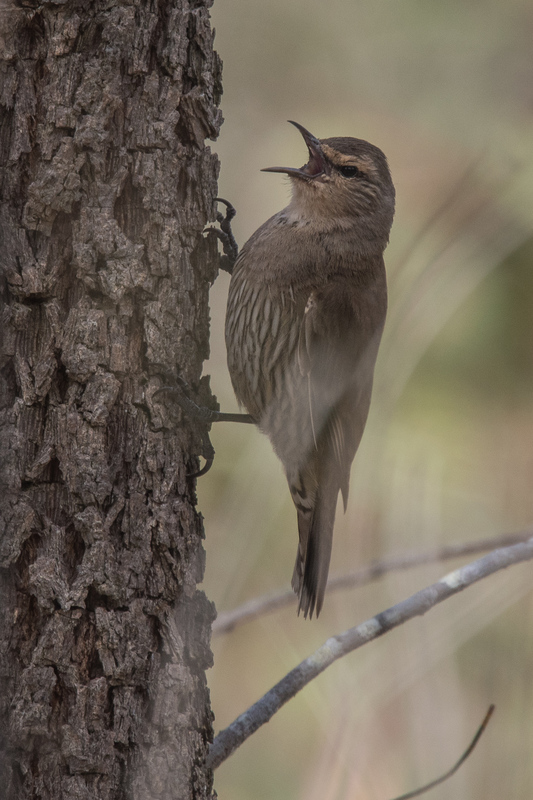 On the track in, just about every tree had its own Striated Pardolote in residence, and many of them were happy to come and see what was going on. A small flock of weebills went by also, Would that be a wee flock of weebills? But the highlight of the day was down in the clearing near the rangers work area. 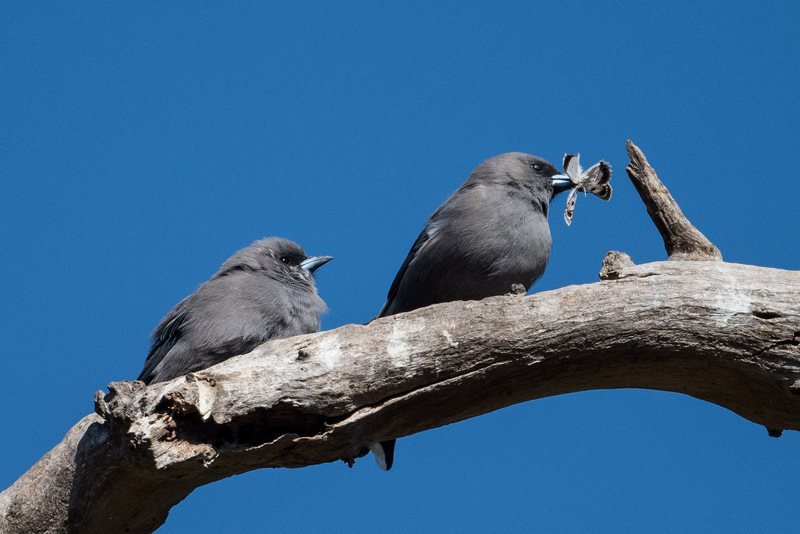 A number of Dusky Woodswallows were at play in the open area. We sat and watched for about 30 minutes. Now there are some rules to the games, and that became apparent. 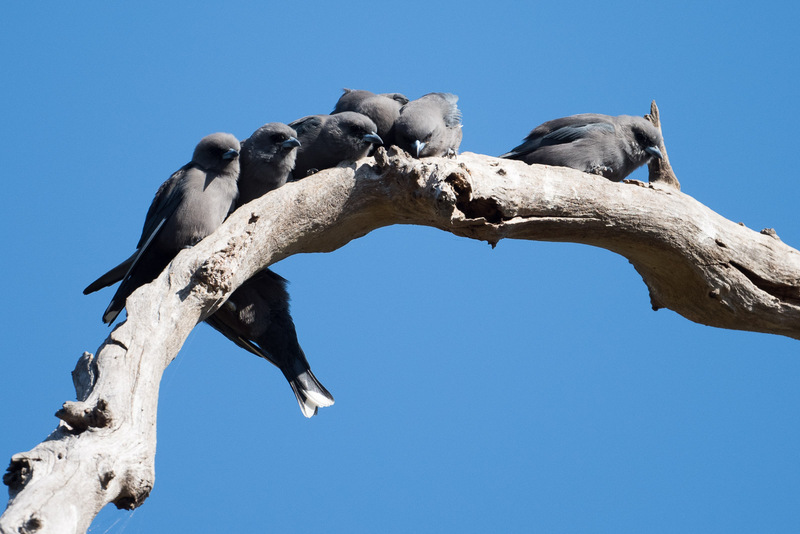 One rule is:Everybody find a perch on a tree- not the same tree. Rule two was one by one try to unperch the ones with the best location. Rule three: unperched birds can then try to remove the next most likely location. The problem with the game is that rule three deteriorates into three or more birds on the one perch squabbling about whose site it is. Good naturedly they then all fly off for a well earned feed. After some circling of the watching humans, rest momentarily and go back to rule one. 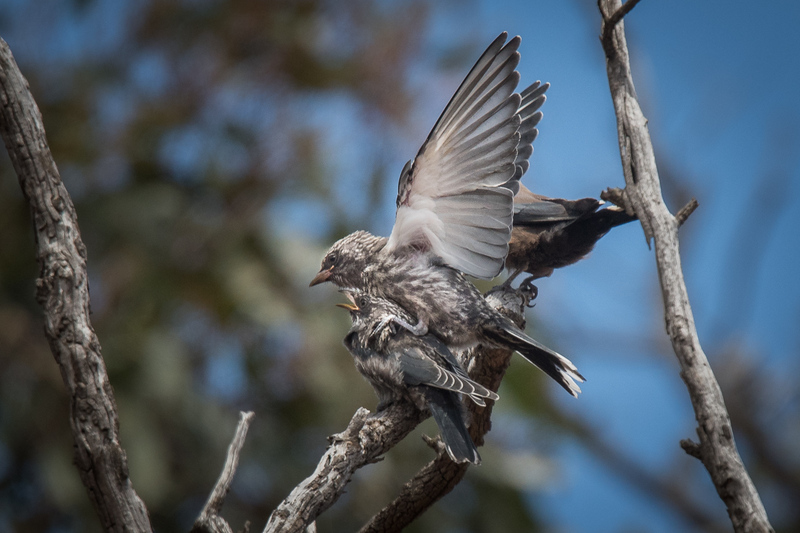 If there was a rule four, it seemed to have something to do with agitating the local Willie Wagtails who were busy getting acquainted. The walk back to the car uncovered a covered up Pallid Cuckoo. 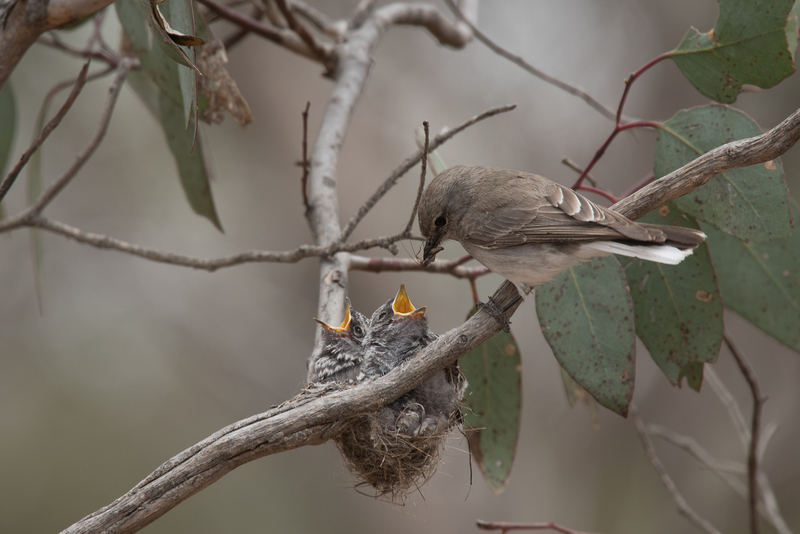 They had been calling all morning, and this one was close to the working area of a family of Superb Fairy Wrens. It didn’t seem to mind me taking a closer look at it. After a couple of days of what can only be described as ‘typical’ Melbourne weather, the clouds eased off a bit, and the biting chill was gone from the wind. So we both ventured out to see what the rain had done in the park. 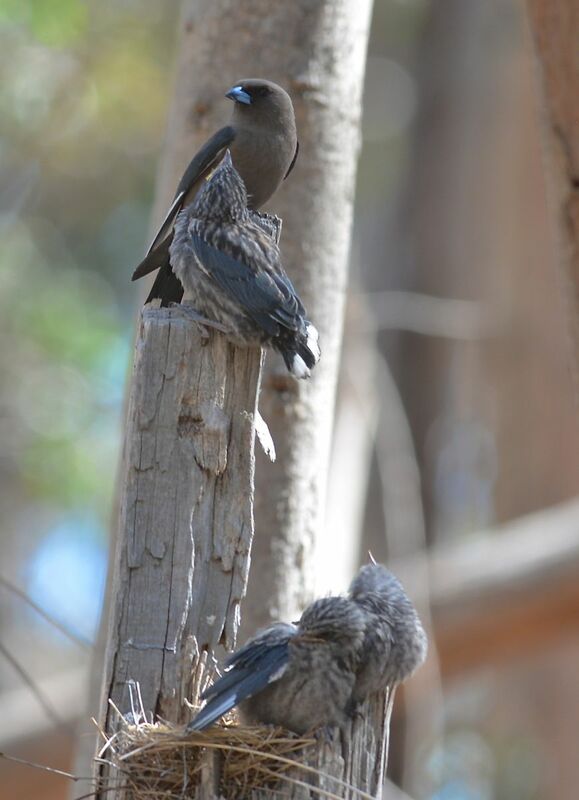 We quickly found a number of Thornbills and Pardalottes who were enjoying hunting in the sunshine. Also found a few robins Scarlet is still there and his Red-capped consort has taken on a particularly brilliant orange/rust coloured cap. 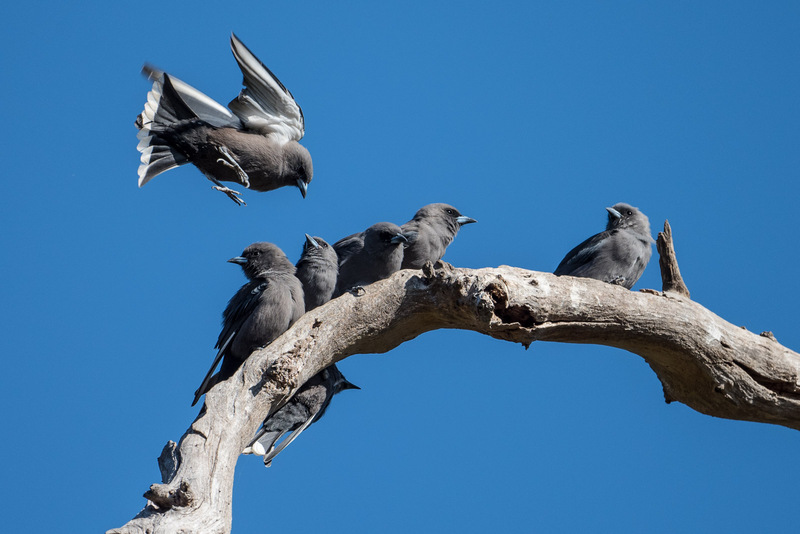 A small group of Dusky Woodswallows were enthralled with a small lump on a tree high up and spent a lot of time squabbling and mobbing one another, for what we suspect was a pool of water built up in the node on the tree. And a lovely Redcapped Robin male danced by and posed against a freshly built spider-web. Pity the light was just overcast at the time as the web would have glistened in the sunlight. Red-capped Robin male and a spider web contrast. 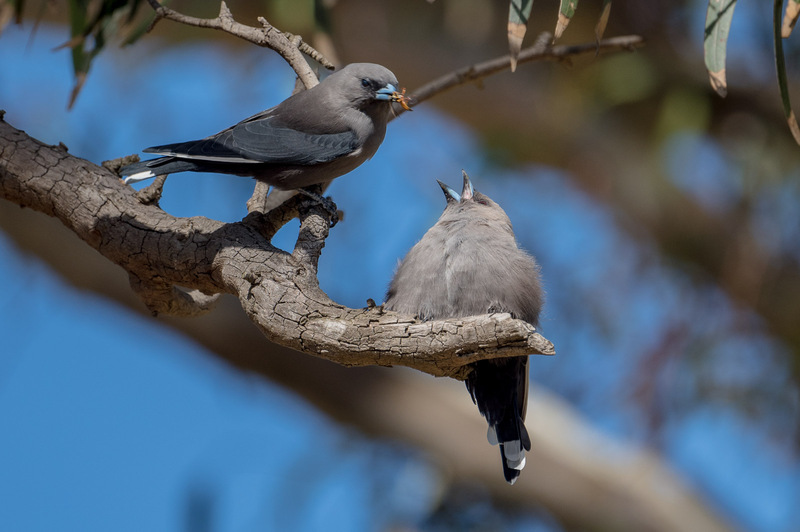 Dusky Woodswallow flock taking a drink from a small pool of water high up in a tree.